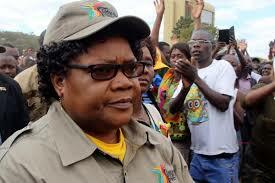 OPPOSITION National People's Party (NPP) leader Joice Mujuru has dismissed speculative reports that she was in coalition talks with the newly-formed National Patriotic Front fronted by former resident minister Ambrose Mutinhiri. Mujuru's deputy, Samuel Sipepa Nkomo told NewsDay they would not enter into an alliance with a party associated with former President Robert Mugabe. "I don't think there is a possibility that we will work together. The first thing is Mutinhiri is said to be president of that party, but we are aware from our intelligence that the real powers behind that party are Mugabe and his wife. We don't want to work with those people," he said. Mutinhiri, a former Mashonaland East Provincial Affairs minister was recently announced as NPF leader hours after meeting Mugabe at his private residence. He then claimed the former Zanu-PF leader had "promised to lend his full weight" behind the new political project viewed as a plot by an angry Mugabe still smarting from his inglorious exit from power last November at the hands of President Emmerson Mnangagwa and his acolytes in the military. Asked if Mugabe had brought up the issue of a possible coalition when he met Mujuru last month, Sipepa Nkomo said: "That did not arise at all. Mugabe and president Mujuru discussed outstanding issues from her expulsion from the party and government. They prayed and parted ways. I would have known if that had been discussed." But a source close to Mujuru insisted that she was warming up to the idea of joining hands with NPF. NPF spokesperson Jealous Mawarire could not confirm nor deny the proposed coalition deal. "We have formed a political party to contest elections and we are working on our structures. We are not looking at what others are doing. "Be that as it may we are open to working with any Zimbabwean who wants to join us and that is not limited to Dr Mujuru. We welcome any Zimbabwean to our project regardless of political parties they are currently working with," he said. Mujuru was unceremoniously expelled from Zanu-PF and government in December 2014, as part of a brutal purge meant to stem factionalism in the party. Mugabe reportedly later apologised to Mujuru for the fiasco which he blamed on his wife, former First Lady Grace. Mugabe is reportedly working on a plot to spoil Mnangagwa's chances of winning the election by stitching up a coalition between Mujuru and Mutinhiri to dilute Zanu-PF's support in Mashonaland East, West and Central in particular. The three provinces are considered Zanu-PF's strongholds.